We had a really good time exploring Russell! We could not believe how friendly everyone in Russell was to us! Enjoy a Waudby's burger in one of the oldest buildings in Russell. The building was constructed in 1885-86 using limestone, iron trim for doors and windows, brick and large glass windows. 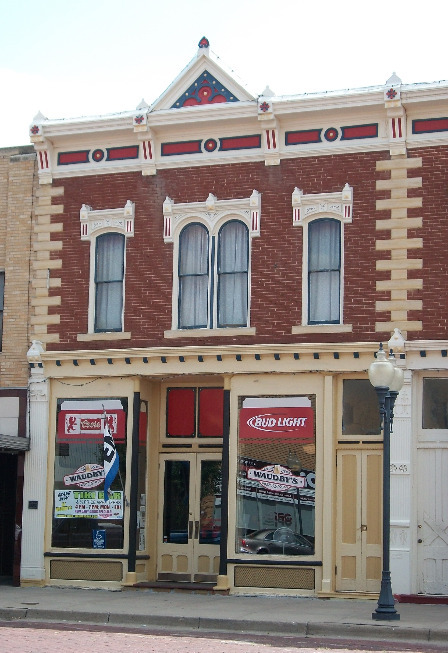 The Victorian design of the building gave a new look to Russell’s Main Street. Throughout the years this building has housed a hardware store, post office, bank, and furniture store. In 1923 oil was discovered in Russell County and it changed the social and economic structure of the county. Oil field workers were looking for recreation in their spare time and to meet this need, in 1926, Alfred Waudby purchased the building and opened a pool hall. Not only is Waudby's one of the oldest buildings in Russell, but is also of artistic significance. There are two scenic murals painted on the inside of the building. One mural depicts a mountain scene with a lake in spring or summer and the other is a winter scene. A transient painter, named “Gesser,” painted the murals in 1939. Rick Rupp restored the murals in 2004. No structural changes have been made to the building. It remains today much as it was in the early part of the 20th century.